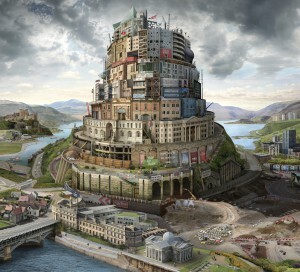 The ‘Tower of Babel’ is a compelling motif with which to portray a city from a contemporary perspective and is a recurring theme in Allchurch’s work. The construction allows for multiple viewpoints and layers of history to be represented within a single structure. In March 2018 Babel Hong Kong was launched at Hong Kong’s Art Central, and in February 2018 Babel Britain (after Verhaecht) was awarded the Columbia Threadneedle Prize Visitors’ Choice Award. Tower of London (after Bruegel) 2005, the first in the series, recreates Pieter Bruegel’s Tower of Babel (1563, Kunsthistoriches Museum, Vienna) from photographs of London. Bruegel’s image mocks those who, according to the Old Testament, tried to reach God by building a tower to the heavens and were then divinely punished and made to speak in different tongues. Just as Bruegel’s painting was a response to religious unease in his times, so Allchurch’s lightbox explores the religious and cultural diversity of the capital prevailing despite threats to its cohesion in the aftermath of the terrorist bombings of 2005. 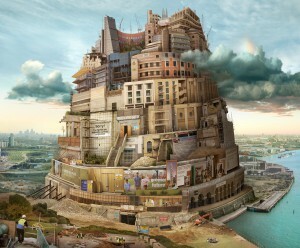 Ten years later Allchurch revisited the theme in Babel London (after Bruegel) 2015. This later work reflects upon the property boom engulfing the capital and can be seen as both a celebration of and warning about architectural hubris. A perpetual ‘work in progress’, the city is depicted as a monumental building site. Shiny new towers on London’s skyline are shown protected by a barricade of hoardings and CCTV surveillance, making them unobtainable to all but a few. As the graffiti poster proclaims, many Londoners are feeling that the lifestyle they ordered is indeed ‘currently out of stock’. We are left questioning who exactly will benefit from the ‘greener future’ promised by the property developers? Who will be squeezed out in the process and at what cost to the diversity of London? Oslo Story 2016 was commissioned by the Municipality of Oslo for a refurbished kindergarten in the Haugenstua district of the city. Inspired by the Babel theme, this large-scale capriccio presents the Norwegian capital as an island, constructed from well-known local buildings, seen from the vantage point of a wooded landscape. Babel Britain (after Verhaecht) 2017, once again adopts the Tower of Babel theme, but this time as a comment on the state of Britain in its entirety. 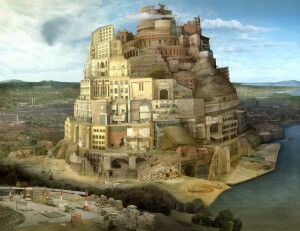 Based upon Tobias Verhaecht’s (1561-1631) large-scale painting of the ‘Tower of Babel’, displayed at the Norwich Castle Museum and Art Gallery, this recreation depicts an increasingly divided country, on the cusp of Brexit, and at a pivotal moment in its history. Construction of this colossal tower appears unstoppable, despite the storms clouds gathering overhead, and the shadow cast by the disaster of Grenfell Tower, a tragic event which occurred while Allchurch was working on the piece. As with all her works, Babel Britain is peppered with topical markers spotted in the environment: signage, graffiti, property developers’ advertising hyperbole, street art, and protest banners – all of which help to reinforce a message of political and economic uncertainty, as well as growing inequality of wealth. In 2017, Allchurch began an exciting new collaboration with Karin Weber Gallery in Hong Kong. With an award from the Arts Council England / British Council Artists’ International Development Fund, she visited Hong Kong for the first time to collate a vast image library of the territory. Meetings and guided tours with local artists and academics gave invaluable insight into the challenges facing Hong Kong residents: lack of space, inequality of wealth, housing shortage, and pollution. 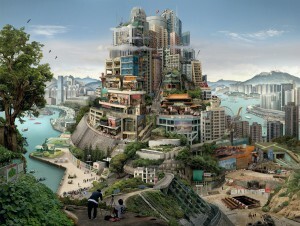 Loosely inspired by the 1595 ‘Tower of Babel’ by Flemish painter Lucas van Valkenborch, the resulting image, Babel Hong Kong 2018, also draws strongly from Chinese painting traditions in its multiple perspectives and meandering paths which guide the viewer through an unabashedly urban cityscape leading to misty mountain ranges in the distance. Shopping malls, temples, public housing, land reclamation, construction sites and congested expressways jostle for position on the lower tiers, whilst big corporations and the well-heeled seemingly rise above the pollution, and the clouds.